Is There a Best Way to Meal Plan? The price of groceries just seems to keep going up, and up, and up. How much I’ve spent on groceries has nearly doubled in the last five years. True, my kids are older and hungrier, but in general, the price of groceries themselves has increased. In our household, groceries are our biggest monthly expense behind our mortgage. If you’re like my family, you’re constantly looking for a way to cut your monthly grocery costs. I’ve found that reducing grocery expenses largely comes down to making a plan and sticking to it. There are several ways to do this. Some people lower their grocery costs by making a monthly meal plan and shopping once a month. Of course, when I say shopping once a month, that doesn’t mean it’s the only time that they go to the store. Rather, they have one large shopping trip at the beginning of the month, and then they go to the store 1 to 3 more times during the month to get fresh produce and milk as needed. This technique can save money mainly because you keep yourself out of the stores and avoid impulse buys by doing so. You’ve likely gone into the store to buy one or two items and found yourself walking out with a cartload of groceries. Those impulse buys, even if there a good deal, can destroy your budget. Those who shop once a month reduce their spending simply by reducing the number of times they allow themselves access to the grocery store and impulse buys. Another technique is to make a weekly menu plan based on what you find on sale in the grocery store flyers. Between the items that you see on sale and the items that you already have in your house, you make a menu plan and shop for the loss leaders and whatever other items you need to make your meals. Still others go to their favorite store first and scout out the good, unadvertised deals. For instance, if pasta is on clearance, they may buy many bags of it and have several pasta meals that week. If they find a great deal on beef, they may make a stroganoff using the beef and pasta for one meal, and a spaghetti bolognese for another meal. These planners find the good sales and then make a menu plan. Once they get home, they rely on Pinterest, the internet and sites like MyFridgeFood to help them decide what to serve based on the great sales they found. For years I have debated about which method works best and which one saves the most money. But, the bottom line is that you must choose the method that works best for you and your family. In this season of our family life, method two works best for us. However, it doesn’t matter which method works best for your family. What really matters if you want to cut your grocery costs is that you have a plan and you utilize one of these three methods. 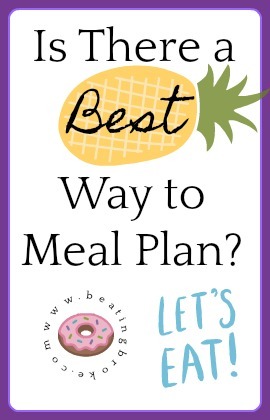 What is your favorite way to menu plan and save money? Do you prefer one of these methods or a different one? Earning Extra Income vs. 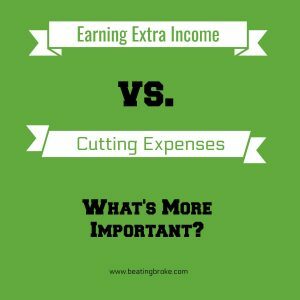 Cutting Expenses: What’s More Important? When it comes to saving money, there are two ways to skin the proverbial cat: Earn more income or cut expenses. The option you choose depends on whether you’d rather reduce spending or work harder to pay for that spending. Both approaches will put you further ahead financially, and – if you’re serious about piling up some cash – you could buckle down and do both. However, if you had to pick one, which is the better way to get ahead? Let’s look at the pros and cons of each to find out. Many people prefer the idea of earning more money as opposed to cutting they’re spending. After all, the idea of cutting back one’s lifestyle doesn’t appeal to most people. Plus, when asked if they spend money wisely, many people would agree that they already do. Most people want to earn more money – Who wouldn’t want to increase their income? Duh! Making more income means a person has more money to spend or save. Although getting a second job is always an option, you might want to consider trying one of the best work from home jobs instead. Plan B in case of a job loss – Taking on a side gig to earn extra income can also be a good fallback plan in case you lose your job. One never knows when they may be blindsided by a job loss, and having another way of bringing home some income is a great way to survive until you get back on your feet. Discover a better way to earn an income – Sometimes a side gig can turn into full-time gig. That’s what happened to us. The income that we make from our blog is far more than we ever made working a full-time job. Plus, we get to be our own boss and work on our own terms. Control over how much money you earn – Want to make an extra $100 a week? No problem! With a side gig, you get to decide how much extra income you want to make and when you want to earn it. Chance to try out a side hustle idea – Have you always wondered if you would like freelance writing or being a dog walker to earn extra income? Rather than quit your regular job, why not try the side gig you’ve always wondered about and see if it’s a good fit? You might find something you love doing without risking your day job to try it out. Who knows? It could even take your life in a whole other direction like it did for us. Wipe out some debt – Wouldn’t it be great to kill some debt with the extra money you earn? Or, maybe you need some extra cash for the home renovations or trip you’ve been dreaming of? Starting a side job could help you save enough money for those things before you know it! Too burned out from your regular job – The idea of working more in addition to a full-time job can be overwhelming for some people. If you are already burned out from your day job, a side gig may be out of the question. No spare time – Let’s be honest: Working a side gig requires time which you may be unable (or unwilling) to give up. If you have children or other family commitments, such as caregiving for an ill family member, a side gig may not be feasible. One of the easiest ways to start saving money is to spend less of it. Control over consumption – If you’d like to gain some control over the consumption monster in your household and have more money left over at the end of the month, cutting expenses is definitely the way to go. Most people want to make more money because there’s always more “things” they want to buy. However, when is enough enough? People are often surprised to find that they are just as content spending less money rather than more. Less money wasted – Regardless of how much money you make, you work hard for it. So, letting it go to waste shouldn’t be acceptable. By taking a hard look at your expenses, it quickly becomes obvious where you’re spending well and where you’re basically flushing it down the drain on things that don’t really matter to you. Some of the most common spending traps are gym memberships you don’t use, cable TV, landline phones, huge cell phone bills and data plans, and eating out rather than cooking at home. More control and more time – The most important benefit of cutting expenses is that you need less money to live. Having fewer expenses may allow you to cut back to part time work, stay home with your children, or free up time to pursue a hobby. When you live on less, it frees up more time to do things other than work. You might even find that your time is much more valuable than making a few extra bucks to spend on junk you don’t really want anyway. Nothing left to cut back on – If you’re already living on a bare-bones budget, cutting expenses even further may not be possible. Everyone needs a certain amount of money to live, and – if there’s no fat left to trim – you may have to look for ways to make more money instead. Unnecessary suffering – If you are already extremely diligent about spending your money wisely, cutting expenses even further may cause unnecessary discomfort. However, this is rarely the case. You must be honest with yourself. Are you struggling to meet legitimate expenses or are you simply spending too much? If you’re couch-surfing because you truly can’t afford a place of your own, cutting expenses may not help much. If you struggle to make the rent because you eat out 10 times a week, it’s time to change your habits. So, is it better to earn more or spend less? Honestly, a combination of both is typically the most effective attack. By spending less and making more, you’ll be able to quickly beef up your monthly savings. Your long-term savings will also improve because you’ll be able to live on less. How do you prefer to save money? Which of these options do you think is best?